In about 1630, barely twenty years after the publication by A. S. Forsius of the first hand-drawn colour-circle, the first printed colour-circle appeared in a medical work by the Englishman Robert Fludd (1574-1637). 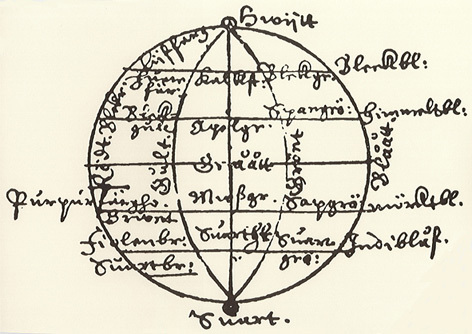 His colour-wheel has a total of seven areas around its circumference, and thus points to its ancestral link with Aristotle‘s line. Fludd distorts this classical line, to join it back upon itself. He places black and white («Niger» and «Albus») firmly next to each other, with red («Rubeus») opposite them as a «medium». All three are granted the same status as the four other colours, which we know as green («viridis»), blue («coeruleus»), yellow («flavus») and orange («croceus»). Fludd, who also referred himself De Fluctibus, was the author of a total of 20 works in the Latin language — including the History of the Macrocosm and the Microcosm — which for us contain many incomprehensible ideas. He takes up the opposite view to Johannes Kepler in his writings, and introduces three principles of the world: darkness, water and divine light, the latter bringing life to everything. His work with colours appears in a book which attempts to create a «Medicina Catholica», and although Fludd had intended to produce a universal medical textbook, only one volume ever materialised, between 1629 and 1631. Throughout its 200 pages, Fludd occupies himself with a diagnosis of his observations on urine. Through its colour and consistency, he attempts to draw conclusions about a patient’s state of health. Fludd’s basic approach, the course of which can be followed into the modern age, rests on a firm conviction concerning a metaphysical duality, manifest on earth by the opposite poles of light and darkness. 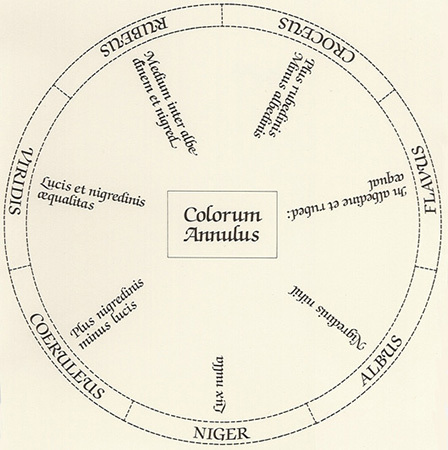 The purpose of his colour circle («Colorum Annulus») is to trace each colour back to this duality. He also made the fundamental observation that colours are not mere coincidence («as the ancient philosophers would maintain») but that essences were involved here with which the Maker imbued his creations. The colours of things, in other words, are a part of their elementary make-up. The ideas of Aristotle thus remain influential well into the 17th century, and for this reason a short description — for which there was previously no space — is now worthwhile. In principle, it must be noted that colour theories from the Antiquity relate to a few basic colours and their corresponding mixtures. Our understanding of these theories is hindered because our language is almost incapable of expressing the terms used for colours by Greek or Latin. Translators of the Aristotelian texts, for example, have pointed out time and again that one and the same word was often used to describe various tints. 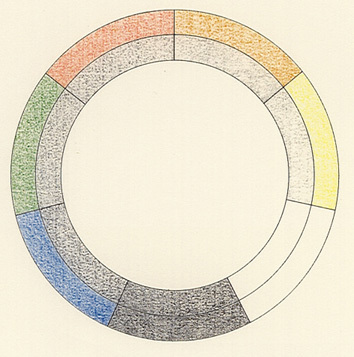 This is partly because many colour names did not primarily describe a colour hue, but rather the material from which the colour can be extracted. Individual words thus cover a whole range of different brightnesses or brilliances not implied by our modern (standardised) colour phraseology. Aristotle (384-322 B.C.) had three predecessors, who all commenced with four colours. Empedocles (circa 500-430 B.C.) named white, black, red and yellow-ochre, to which he allocated the four elements: fire, earth, water and air. The only sure associations here, however unusual they may appear to us, are those of white with fire and black with water. Empedocles’ interest was in chemical composition, as it would nowadays be described, while Democritus (circa 460-370 B.C.) tended to adopt a physicists view, with the emphasis being placed on certain atomic relationships. He likewise specified four colours, but replaced yellow-ochre with a greenish yellow. In addition to his primary colours, he specifies colour mixtures derived from these — seven in all: alongside yellow-red, purple, indigo, leek green and dark blue is a nut colour and a fire colour, which we are to imagine as a bright brown-yellow. Plato (427-348 B.C.) stays with these four basic colours (white, black, red and «brilliant»). Neither chemistry nor physics are important to him. Colour is basically an element of beauty, and its shine should enhance its effect. Aristotle is in turn more practical. He restricts the basic colours to the two extremes of black and white, defined by either the absence or presence of light. Light on its own is thus white, and for that reason he assigns this to the element air. This is an important point: in Aristotle’s case, («De sensu et sensibili») light itself is colourless. Light is only the medium by which colours can be seen — those colours, in fact, which objects possess. Colours appear at the point where a body is no longer transparent. Aristotles constructs the many colours of the world by mixing, which takes place on various levels. The five colours of his scale are formed from black and white-yellow, scarlet, purple, leek green and dark blue — which in turn can be mixed. The secondary colours arise from the juxtaposition of the smallest points of basic colours which are no longer perceivable by the human eye, from the superimposition of basic colour layers, or through blending coloured substances. Aristotle‘s theories remain influential up until the time of Fludd in the early 17th century. They were not confined to Europe, having intensively occupied the Arabic philosophers, who were to re-examine the relationship between light and colour in the 11th century. Avicenna (died 1037) disputed the existence of colours where darkness prevailed, since without light the vital «verum esse» would be denied them. His adversary Alhazen (died 1038) took the opposite view — that colours indeed exist in darkness, but did not reach the eye. In the European Middle Ages, Roger Bacon (died 1294) looked into this question once more, declaring that light and colour only occur when combined («Lux … non venit sine colore»). He strongly opposed Aristotle, mainly objecting to the names of the colours and their translation. 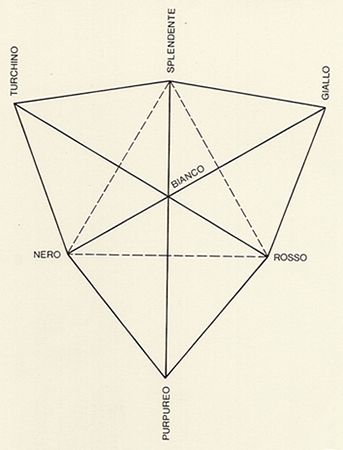 With Bacon, the terms «albedo» (white), «rubedo» (red), «viritas» (green) and «nigredo» (black) emerge, but he also insists on a fifth colour which he calls «glaucitas», probably meaning a bright blue. We shall close this study with a reference to the Nikolaus Cusanus (1401-1464), the Bishop of Brixen, who was the first to express the idea that light did not so much reveal the colour of objects as create the colours themselves: «Omnis esse colores datur per lucem descendentum». And he said something delightful: the transient, earthly things, according to Cusanus’ observations, change their colours when they change themselves. He thus concludes that the purpose of colours is to visually demonstrate an «ability to become». Colours, therefore, show what life can do. Date: The system appeared between 1629 and 1631 in a work on medicine. Bibliography: R. Fludd, «Medicina Catholica», 2 volumes, Frankfurt, C. Rötelli, 1629-1631; J. Godwin, «Robert Fludd Hermetic philosopher and surveyor of two worlds», London 1979; John Gage, «Colour and Culture, Practice and Meaning from Antiquity to Abstraction», Thames and Hudson, 1993, pp. 9 and 171 (mention and comment).